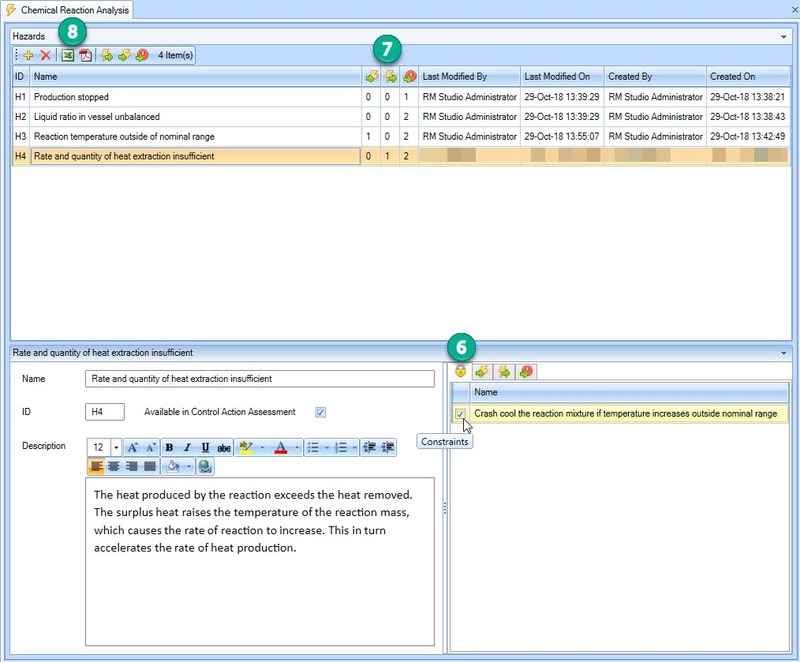 System Level Hazards can be defined in multiple ways in the RM Studio STPA Module. You can create them under the Hazards node or in the Relationship node in the STPA Project Overview. Once created, the hazards can be linked to Losses. Additionally, System Level Hazards can be refined by sub-hazards and therefore a hazard may be linked to another hazard or to a loss. A loss may only link to a hazard. 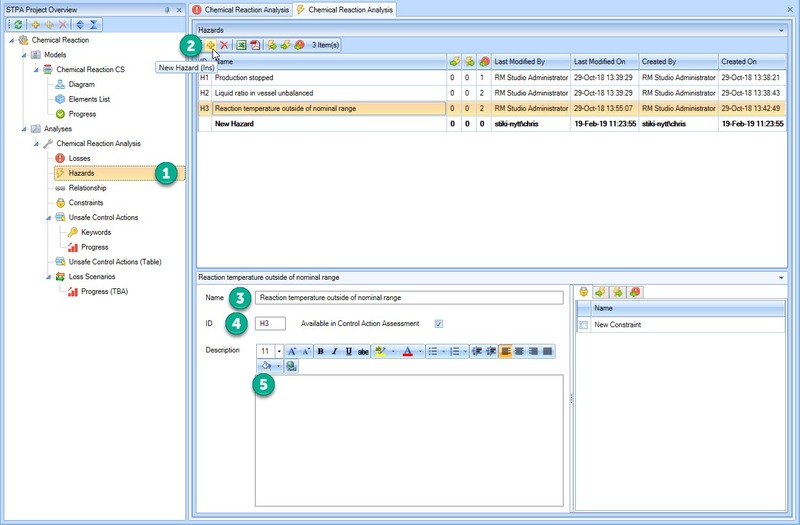 Double click Hazards node in the STPA Project Tree and notice the new tab with the icon opening in the work space to the right of the STPA Project tree. Click icon in the toolbar to create a new hazard. By default, the new hazard is selected and labelled “New Hazard”. Change the Name of the hazard by clicking on the text box for Name. Optionally provide an ID (e.g. H1, H-2, etc.) Leave the “Available in Control Action Assessment” checkbox ticked unless you want to explicitly exclude this hazard in the UCA identification (for example this hazard has refined hazards and the analyst only wants the refined hazards available in UCA). Add an optional description and any other information for clarifying the hazard. Save your progress now to allow the name to save for the list (‘Ctrl+S’ or ). Select any Constraints , Hazards , or Losses the hazard relates to (this can also be done in the Relationship node). The columns tally the number of hazards and losses linked to the hazard. You can export the data into an Excel sheet or PDF.